I first met Sam Garrett-Pate at our communications firm’s June birthday party, which he had turned into an annual Pride Month celebration. He was rushing through the halls of our office, meticulously instructing the staff on where and how to hang the rainbow decorations and making sure everything looked spectacular — no detail was too small. This wasn’t just a party for Sam. This was a history lesson, and he made sure that everyone in the office understood the meaning and significance of Pride. In order for his colleagues to be true progressive leaders and change-makers, he knew we needed to fully understand both the oppression the LGBTQ community has faced and its resilience. Because that’s who Sam is. He’s made a career of pushing people to be the best versions of themselves. He doesn’t accept mediocrity and always gravitates toward the underdog, the marginalized or the underestimated in order to help pave a path toward success. Sam started his career in Washington, DC, working on anti-bullying and safe schools initiatives under Assistant Deputy Education Secretary Kevin Jennings and later serving as an aide to Congressman Sean Patrick Maloney of New York. From Capitol Hill to the campaign trail, Sam helped drive the openly gay Congressman’s advocacy for LGBTQ civil rights — including the fight for marriage equality. When Sam’s husband Matthew got an opportunity to attend the law school of his dreams, the two packed up their lives and moved to Los Angeles. Having never lived or worked on the West Coast, Sam relished the challenge of a new environment and quickly worked his way up to being a well-respected communications strategist. That’s when we met and eventually became officemates. 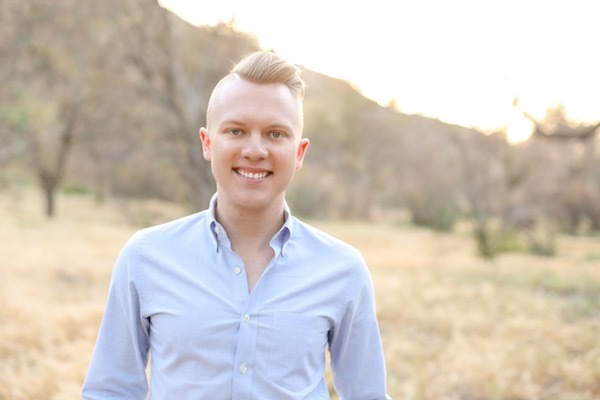 Two months ago, Sam left our firm to join Equality California as the organization’s new communications director and spokesperson. Somehow I always knew — from the moment I saw him running around at that June birthday/Pride party — that Sam would find his way back to the LGBTQ civil rights movement. And I know the movement is happy (and as Congressman Maloney said, lucky) to have him back. I first came out 11 years ago. I think that question is tricky though because we all come out every day. Every time I mention my husband to the grocery store cashier or explain what I do for a living to a waiter at a restaurant, I’m coming out. Those, for me, are the hardest conversations because I never know what to expect. Edie Windsor. I really admire the fact that she never stopped fighting for love. I’m a bit obsessed with Bar Mattachine. It’s downtown, has great cocktails and I’m pretty sure Pickle hosts the best drag trivia in Southern California. I married my husband on a boat in Newport Harbor, which was pretty dreamy. But I think if I could do it all over again, I’d opt for a taco truck and great wine in someone’s backyard. I’m really passionate about education — about every child having a shot at success at a safe and supportive public school. But that’s an LGBTQ issue, too (as are most issues in some way or another). Bobby Kennedy should have been president. I’ll never forget the day Michael Jackson died. I’m not entirely sure why, but I know I’ll never forget it. Loyalty. Not to a person, but to a cause. I thanked Joy Reid for her apology to the LGBTQ community. No one is perfect. The most we can ask of anyone is acknowledgment of past mistakes and growth. Start recruiting. (Kidding.) In all seriousness, I love being gay and would never change that about myself — even if it were an option. I’d like to hope that Hogwarts is real. Facts don’t change hearts and minds — stories do. My cats, my nephews, my sister and my husband. That gay men don’t like football. Fight on! Meal times. I think everyone should feel free to eat what they want when they want it. Nothing compares to winning an election. I was living in DC at the time — I wish I’d realized sooner that winter is overrated.